One reason for the MSPs not having the desired impact could be the delayed announcement. Farmers usually make sowing decisions before the onset of the monsoon. The government may have substantially hiked minimum support prices (MSP) of crops being grown in the current kharif season. That, along with most parts of India receiving good rain until now, should have considerably boosted plantings by farmers this time. However, the Agriculture Ministry’s sowing data shows the total reported acreage under kharif crops, as on Friday, at 737.96 lakh hectares (lh). This is below not only the 797.69 lh for the same period of 2017, but also the corresponding coverage of 762.06 lh and 748.96 lh recorded in the preceding two years. The main cause of lagging plantings does not seem to be the monsoon. According to India Meteorological Department, the country received an area-weighted rainfall of 403.2 mm during the current southwest monsoon season (June-September) until Friday. This was only 2.9 per cent lower than the long period average of 415.3 mm for this period, well within the “normal” deviation. Moreover, the rain has been normal-to-excess in 79 per cent of the country’s area. The only major crop likely to have been impacted by the monsoon is paddy. Paddy acreage is down nearly 28 lh compared to what it was at this time last year. This entire decline is practically accounted for by four states — Uttar Pradesh, Bihar, Jharkhand and Assam — that have registered deficient monsoon rainfall. But it’s not just the paddy area that has fallen. 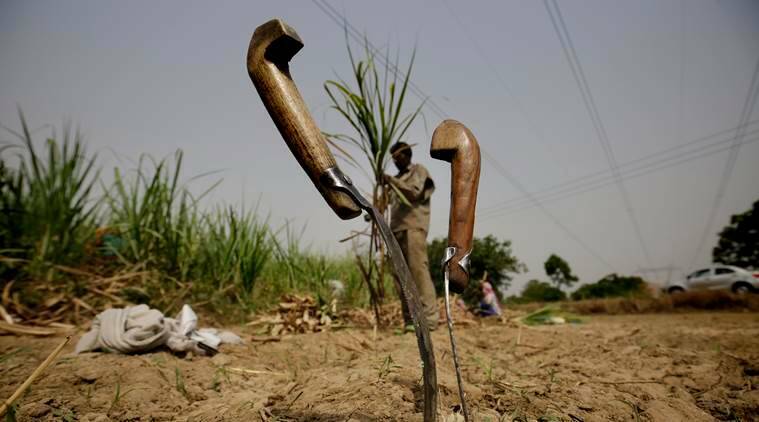 Of the 14 notified kharif crops for which MSPs are fixed, farmers have reduced plantings in as many as 11. That includes ragi, niger seed, bajra and sunflower, despite their MSPs being raised by between 31 per cent and 52.5 per cent. The only crops that have seen higher acreages this time are soyabean, moong and jowar, although the extent of it is not commensurate with the MSP increases granted even in their case (see accompanying table). One reason for the MSPs not having the desired impact could be the delayed announcement. Farmers usually make sowing decisions before the onset of the monsoon, which gives them adequate time to plan and arrange for the seeds of the particular crop and variety/hybrid. For the kharif season, the MSPs should ideally be announced by early-June, whereas the Union Cabinet’s “historic decision” — to fix these at 1.5 times the estimated paid-out cultivation cost of crops plus the imputed value of unpaid family labour — came only on July 4. But the main factor behind the lacklustre plantings may have had to do not with the delayed MSP announcement, as much as the low price realisations received by farmers in the recent marketing seasons. 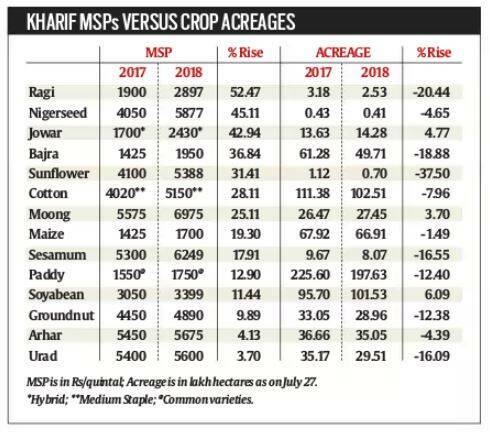 Having seen open market prices — whether of arhar, urad, groundnut or bajra — consistently rule below MSPs, farmers probably haven’t been confident enough about planting more area. The one exception has been soyabean. Farmers have ramped up plantings of the oilseed, which has gained at the expense of urad in Madhya Pradesh, arhar and cotton in Maharashtra, and bajra in Rajasthan. But rather than the MSP, it is the prospect of better prices from tightening supplies and export demand from the Chinese market opening up that appears to have led them to increase soyabean area. In crops other than soyabean and cotton, current market prices are ruling below not just this year’s, but even last year’s MSPs. That, and limited government procurement, explains why farmers’ sowing decisions are influenced more by market price trends and not MSPs.